Although new to the United States, Salt Therapy has been around since the 1800s in Europe. In 1843 doctor Felix Boczkowski formulated that the presence of the air in the salt mines in Wieliczka in Poland saturated with dry salt particles caused healing effects on people with pulmonary and respiratory problems. Today the Wieliczka Salt Mine is operating as the largest Underground Rehabilitation and Treatment Center. They are the world leader in providing innovative rehabilitation and treatment of respiratory diseases by combining both the natural microclimate of the underground salt excavations and the best practices of contemporary medicine. Doctors and scientists came up with a solution. That’s where Halotherapy comes in. Halotherapy comes from the Greek, Halo, for salt. It is a modern holistic method that mimics the natural microclimate of the salt mines. You can get the benefits of three hours in a salt mine in only 45 minutes in a specially designed halochamber, or salt room. Our halogenerator, designed by Dr. Alina Chervinskaya the leading expert in Halotherapy, is used to crush pharmaceutical grade salt into micronized particles that are dispersed through the air in the salt room. Halotherapy is a unique and natural approach for relieving the symptoms of respiratory complaints, dermatological illness and allergies. We have tiled the walls of our cave with this special salt, and have also added two halogenerators which heats, crushes, and disperses micro-particles of the salt into the caves. The concentrations of salt particles can be adjusted for varying respiratory issues. Medical research shows that in order for halo therapy to effectively treat respiratory and skin ailments it is necessary to have a concentration of 3 to 4 milligrams of salt per cubic meter of airspace. Bacteria or viruses cannot live in this high concentration of pure Himalayan salt and therefore cannot be spread through the air to other guests in the cave. 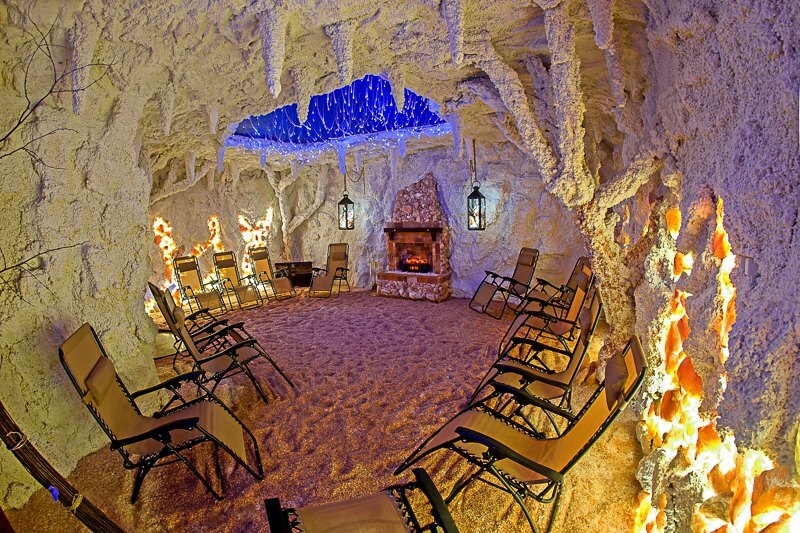 Note: If you have any questions or concerns regarding your medical conditions and halo-therapy, we recommend that you consult with your physician before booking an appointment in the Salt Cave. Main Salt Cave is a quiet-meditative chamber (Adults only please) with soft music playing and dim lights for ultimate relaxation. As soon as you enter Royal Salt Cave you are immediately surrounded by tons of Himalayan salt rocks. This amazingly beautiful and glowing space has been designed for you to feel an immediate sense of relief both on an emotional and a physical level. Our relaxing zero gravity lounge chairs along with the soothing background music bring serenity and peace into your heart in just minutes. The beautiful Salt stones and bricks decorating the walls are made of pure Himalayan Pink Salt. It’s a hand-mind salt that derived from 250 million years old ancient sea salt deposits. That salt has been exposed to enormous pressure for millions of years, causing the formation of that unique crystal salt. Typically, Himalayan Salt contains more than 80 minerals and elements, uncontaminated with any toxins or pollutants. The pink color is due to its high content of iron oxide. You do not need to suffer one more day from allergies, sneezing or coughing. Some relief often occurs with one treatment, and asthma and allergy symptoms typically improve dramatically after a few sessions. The micro climate acts as an anti-inflammatory and decreases the swelling from the inside out. The therapy may be likened to soaking a sprained ankle in Epsom salts, except by breathing in our micro climate, the body naturally decreases internal inflammation to allow expedited healing to occur and symptoms to minimize. 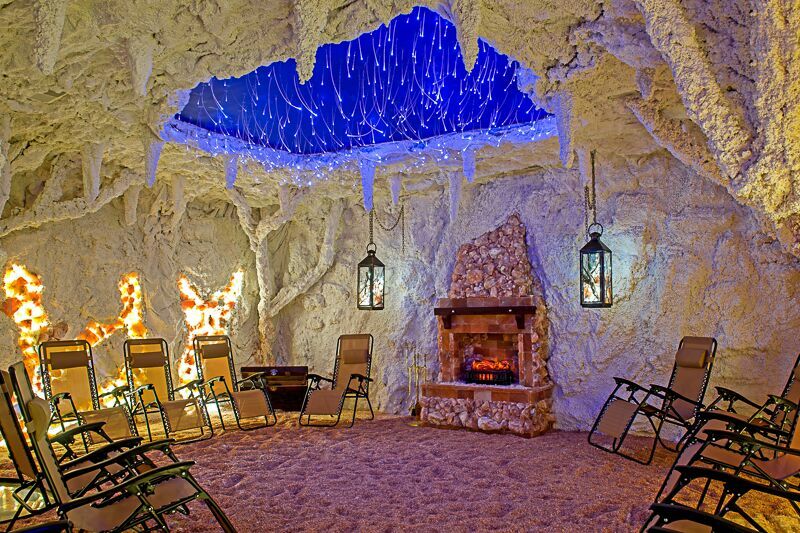 Salt Cave for Kids is our family, group conversation room. We have many parent/child customers, as children can also benefit greatly from halotherapy. Parent/Child groups are welcome, and there’s a children’s play area for the younger children, accompanied by parent or guardian. We also know that it wouldn’t be cost efficient to pay additional fees, so we always allow one supervising parent or guardian to join their child for NO additional cost! Therefore, the parent or guardian will receive a salt therapy session for FREE with their child! Salt therapy is a non-invasive, non-medical, drug and side effect free therapy. It is also a safe, relaxing, warm and FUN environment in which to thrive! Did you know that Children’s Salt Therapy can bring natural relief for Asthma, Allergy and Sinus Infection Symptoms? In fact, our Children’s Salt Room helps breathing issues of all kinds. The effects of inhaling 100% Pure Pharmaceutical Grade Salt can be beneficial for children suffering from allergies, nasal or bronchial inflammation, stuffiness, asthma and other respiratory disorders. It is a wonderful all-natural and chemical-free alternative. 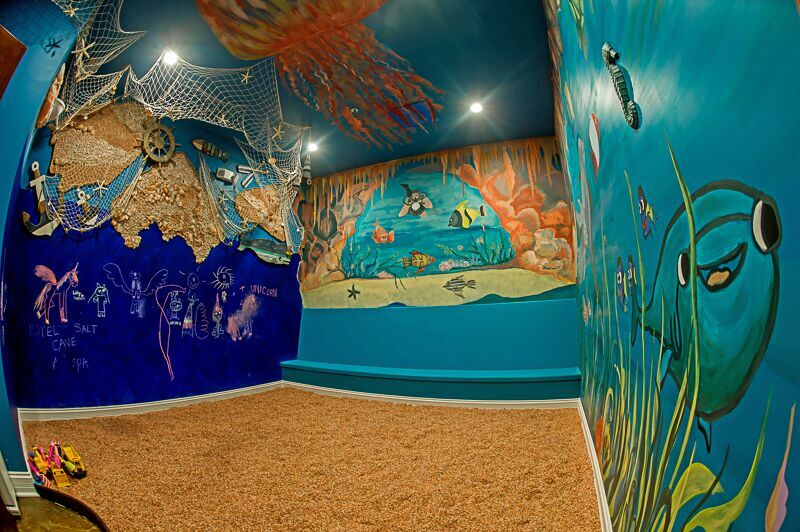 Imagine, while playing in our Children’s Himalayan Salt Play Room, your little one can begin to feel better! Note: Always consult with your doctor prior to using Himalayan Salt as a treatment. Halotherapy or Dry Salt Therapy is 100% natural, safe and drug-free, providing effective long-term relief. It can also, be used for adults and children. It is great for children because this is an alternative medicine that is a natural treatment. Halotherapy (treatment in a simulated salt environment), is widely acclaimed and has been used since the 19th century in Europe. It has recently found its way to Israel and the United Kingdom and now in the USA. A series of 10-12 sessions has been shown to make an enormous difference in patients’ lives. The effect on children has been particularly dramatic. Our Salt Caves experience is designed for convenience. We respect our clients and we ask that they please respect us and our time as well. Please arrive for your session ten minutes before the scheduled time. Late arrivals will not be permitted into the salt room in order not to disturb people enjoying their session. Every salt cave session starts exactly at the beginning of the hour and lasts 45 minutes. Please use the restroom before the session starts. We offer family sessions (adults + kids 0-12) and adults only sessions (13 and older) – when making the reservations please specify the number and age of guests. – for children under 12, a parent or legal guardian must be present during the salt therapy session. Be prepared to stay in the treatment room for the entire 45 minutes session for Adults and 30 minutes session for Kids. In order to keep the environment relaxing and at therapeutic levels, no one is to leave except in emergencies. There’s no need to change your clothing. Casual, loose-fitting clothing is most appropriate. Blankets are provided as well. The treatment rooms are equipped with security cameras for your safety. You may bring electronic devices in the rooms at your own risk. Salt is corrosive to these devices. They must be on silent/vibrate. Any device that uses a fan for internal cooling may not be brought into the salt room. Most people want to relax or meditate during the session so we ask that you remain quiet in the adult Relaxation Room. We provide zero-gravity chairs for your comfort. Please note that these chairs have a maximum weight capacity of 350 lbs. We offer public or private sessions. – you will be scheduled for a public session, which can accommodate up to 14 people, unless you request a private session. Children 12 and under must be accompanied by an adult guardian and use only Salt Cave for Kids. No consumption of food or drinks is allowed in the Halotherapy treatment rooms. Shoes are not allowed in the salt caves. Although the salt is naturally anti-bacterial and anti-microbial we do try to keep it as clean as possible so we request that you wear clean socks at all times in our Salt Cave. For hygienic reasons, please wash your hands or use instant hand sanitizer before each treatment session. Please note that our zero-gravity chairs have a maximum weight capacity of 350 lbs. Our salt sessions begin every hour on the hour and last for 45 minutes. At the top of the hour, the salt begins to circulate throughout the Cave. If you arrive more than 4 minutes past the hour (including coat and shoe removal time), we will not be able to allow you into the session. We cannot disrupt the other clients, nor can we disrupt the flow of the salt. We ask all patrons to arrive at LEAST 15 minutes prior to the appointment time to guarantee access to the session. A 24 hour cancellation notice is required or your credit card will be charged 100% of the fee. Note: If you have a pre-existing health condition, it is strongly advised that you consult with your physician prior to your salt cave session. Dress comfortably for your appointment, but really whatever you have on for the day will be just fine. Once inside the Salt Room you will find yourself surrounded by thousands of pounds of beautiful pink Himalayan salt that cover the walls and floor. As we dim the lights, you can lounge back in one of our zero gravity chairs and listen to the sweet sounds of serene background music to help you relax. When you are comfortable a salt grinder, which breaks the salt grains into micronized particles begins to run. Throughout the 45 minute therapy a dry, fine salt aerosol is delivered into the salt room by a fan. Inside the salt room a monitoring salt sensor is housed and is responsible for measuring the salt aerosol concentrations levels. It receives the information then transmits the data to a controller, which compares and adjusts the salt aerosol concentration based on the specific needs for the people in the room. With a consistently sustained concentration of the dry salt aerosol, the salt room’s environment provides the benefits of natural microclimates. Use Of Color and Light Therapy at Salt Cave and Graduation Tower Room is achieved through the use of photo-diodes scattered in the ceiling together with crystal salt lamps in the walls which diffuse light through the salt creating a light therapy system which has a positive affect on stress, fatigue and depression. The body absorbs energy. When light enters through the eyes or the skin it travels neurological pathways to the pineal glands. Different colors give off different wavelengths of energy and have different effects on physical and psychological functions. It is believed that exposing the body to colored light can aid in healing. Yellow – boosts concentration and has a positive effect on the pancreas and liver; increases neuromuscular tone. Purifies blood, helps digestion, and has a cleansing effect. Strongly stimulates happiness, brings on a sense of security, as well as a strong feeling of well-being. Red – contributes to the sense of rejuvenation and at the same time helps the heart and circulation and to energize and stimulate. It affects the heart by increasing the pulse rate, and the muscles by increasing their tension. It may influence vitality and increases body temperature. May be used to develop excitement and sensuality. Green – is absorbed into the skin where it has a calming effect. It helps to lighten hyper-pigmentation spots revealing a brighter complexion. The calming effect also has anti-inflammatory properties that soothe the surface of the skin. It helps to regulate the pituitary gland, fight depression, bulimia, and other psychosomatic conditions affecting the gastric system. It is useful in calming the nervous system, fights irritability, and insomnia. White – is used for regeneration. It provides energy and balances the chronobiological rhythm, by stimulating the production of serotonin, a substance which regulates both sleep and the nervous system. It can aide in rebalancing the psychophysical and hormonal systems in people who suffer from seasonal depression. The music played during your session has therapeutic properties which aid in the improvement of brain function.